Over the past couple of years, Jumeirah has quickly grown from a residential area into one of the trendiest areas in town! Whether you want to discover quirky new art cafes, try a fun escape room challenge, or devour one of the best desserts in town – here are 7 awesome things to do in Jumeirah. Whether you’re looking for something fun to do with your mates, your date, or even your little ones, Ceramique Cafe is fun for all ages! First, choose your ceramic canvas – this can be anything from mugs and plates to marvel figurines and jewellery boxes. Then, choose your paints and let the creativity flow. This one’s for the serious film buffs! If you’d rather watch movies in a cozy retro cinema, without any kids around, seated in plush chairs (with blankets) and gourmet food served directly to you – Roxy Cinemas at BoxPark Dubai is where you need to go. It’s a little pricey, but costs about the same as most dine-in cinemas in Dubai. Love checking out new street art in Dubai? La Mer Dubai is basically street art paradise, with some of the funkiest murals in town! From artworks that mix local culture with pop art influences, to 3D murals that were made permanent after Dubai Canvas Festival – there’s so much to discover. While you’re there, make sure to chill out on the hammocks on the sea! Wild Wadi Water Park is one of Dubai’s most iconic water parks, and has some of the best water slides in town! From adrenaline-pumping rides like the Burj Surj and Tantrum Alley to the almost-vertical 120 metre long Jumeirah Sceirah water slide, this is definitely an awesome way to beat the summer heat. What’s a pizookie, you ask? It’s just a combination of two of our favourite fast food dishes – pizzas and cookies! This oh-so-chocolatey deep-dish pizza cookie, topped with ice cream and more chocolate sauce is basically a foodie’s dream come true. You can find it at Big Smoke Burger in Box Park, and it’s a must-try if you’ve got a sweet tooth. Did you know that there’s so much more to Galleria Mall than just Slider Station and Home Bakery? They’ve also got a rooftop cinema (which will re-open after summer), Aveda – an awesome salon that loves giving out complimentary massages, Adventure HQ – a fun adventure zone where you can go rock climbing, and Escape Hunt – an escape room! Try out one of their 3 rooms – a murder mystery, a bank heist or a prison break. 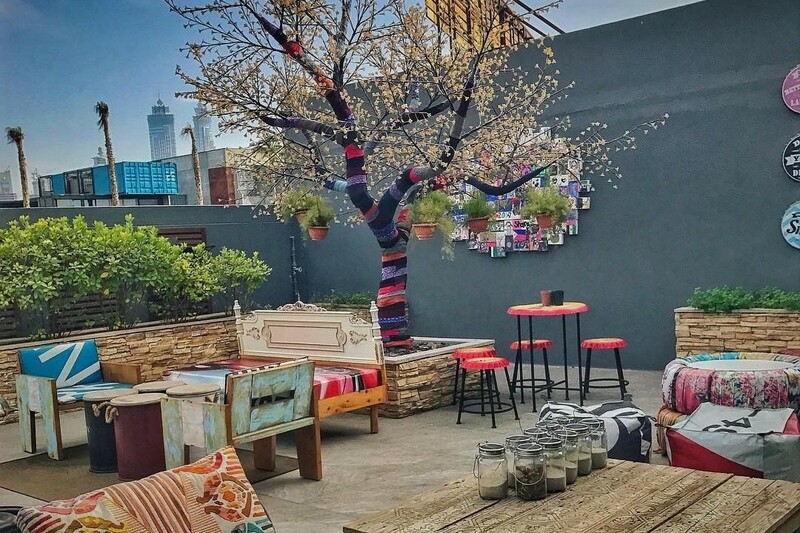 Art House Café is one of the funkiest places to eat, read, hang out and chill in Jumeirah. Head there to play some board games, read a book from their library, get some work done, or just admire the super quirky interiors – think tables made from old suitcases and tea cups as lamps. Read more: Check out some of Dubai’s funkiest street art, or try out 5 of the craziest ice creams in the city.